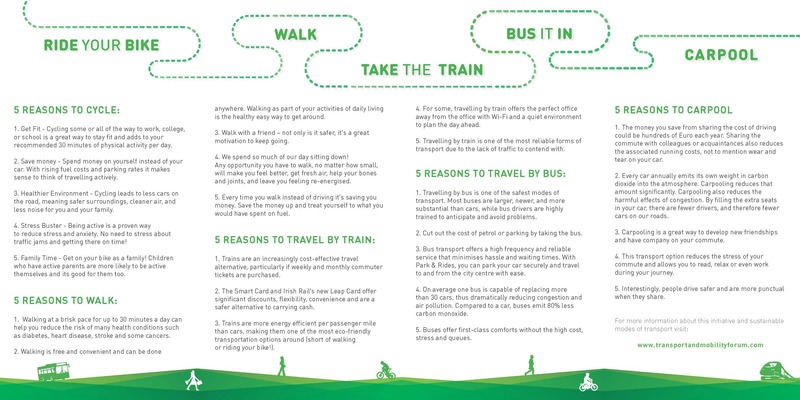 Do you use different modes of travel (Walk, Cycle, Scoot, Skateboard, Park+Stride, Park+Ride, Park+Pool, Carpool, Bus, Train, etc.) to get around your local area? Send us a video or artwork showing your journey. Get Active! Get Creative! And help show the people of Cork how you can leave your car at home and MIX YOUR MODE!! Sustainable travel is a key element of a healthy, efficient and environmentally friendly place to live. It helps its citizens be more active, have cleaner air and reduce transport related carbon emissions. Did you know that 21% of greenhouse gas emissions in Ireland come from the Transport sector? By reducing our reliance on the private car and increasing the use of sustainable and active travel modes, Ireland can have a smaller Carbon Footprint and help combat Climate Change. By taking part in this competition, you are making a difference to your local community and the world. All entries will be showcased on the TMF website and social media as well as at the Mix Your Mode Seminar in March and will therefore make a strong impact on the local community. Students will develop their Creative Skills and enhance their Team Working abilities. Winning groups will receive prizes like Action Cameras, Bike Equipment and Travel Vouchers (Rail, Bus, Leapcards). When and how to submit? Please contact Sandy on 086 1067588 or email tmfcork@gmail.com for support. Our 2015 travel questionnaire has just gone live at the following link – https://www.surveymonkey.com/s/YC2RNSQ. Please take a couple of minutes to give us your feedback. Remember Mix Your Mode week kicks off on Monday 23rd March so why not try a different mode for your commute to work, school or leisure travel. This is an initiative by the Transport and Mobility Forum to promote more sustainable modes of transport by encouraging people to mix their mode of travel. Spring is a good time with brighter mornings and evenings to consider leaving the car behind and trying other options of getting around. Transport in the city has been enhanced with the new and very popular Bike Scheme as well as the introduction of LEAP cards in 2014. Options such as the bus, train, cycling, walking and electric Go Cars in the city are viable alternatives for many. It is hoped that through positive experiences in trying a new mode of travel people would continue changed behaviour patterns in how they get to and from school, work, the shops, a football match or the gym etc. This worldwide event takes place on Friday 19th September (10am and 4pm) and is part of European Mobility Week (16th-22nd Sept). PARK(ing) DAY fits well with the Week’s this year’s motto: “Our Street – Our Choice”. Activities in cities all over Europe are raising awareness for more liveable street spaces for people and improvement of the public realm. On PARK(ing) DAY, a number of car spaces are getting an alternative use for the day: pop-up parks, art installations, seating or play areas, bicycle parking or any other use one can imagine, other than a 1 ½ tonnes car parking on it. Cork City and County Councils are kindly providing the car spaces for that day. On Western Road you’ll find a relaxing seating area created by the HSE outside their Eye, Ear and Throat Hospital. Along the South Mall artists from the Crawford Art College are creating a ‘pop-up’ art gallery and Cork Cycling Campaign have a double space with bike parking and a chill-out space as well as a bike maintenance workshop at lunchtime (near Grand Parade and opposite the Passport Office). Cork Community Artlink have kindly donated some fantastic props for the spaces. On Church St in Douglas, An Taisce Green-Schools with the kind support of the Pavillion Garden Centre are transforming two spaces side-by-side into an interactive play space for children to learn about the benefits of walking, cycling, and the Art Department of Cork County Council have created an interactive art space for all to enjoy. 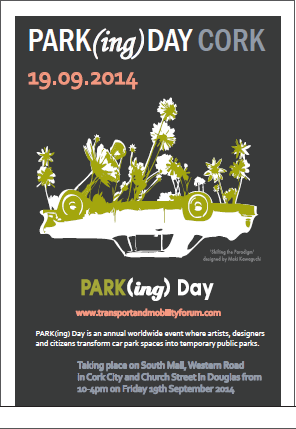 For the first time in Cork, the Transport and Mobility Forum are organising PARK(ing) DAY. This worldwide event will take place on Friday 19th September, when a number of car parking spaces will get an alternative use for the day: pop-up parks, art installations, seating or play area, bicycle parking or any other use one can imagine, other than a one and a half tonne car. Many community groups, NGOs, artists, garden centres have gotten involved along with the HSE, Cork County and City Councils to transform the cityscape for the day. The parking spots will be transformed between 10am and 4pm. Cork City and County Councils are kindly providing the car spaces for that day. On the Western Road you’ll find a relaxing seating area created by the HSE outside their Eye, Ear and Throat Hospital. Why not explore the 3 spaces along the South Mall where artists from the Crawford Art College are creating a ‘pop-up’ art gallery and Cork Cycling Campaign have a double space with bike parking and a chill-out space as well as a doing a bike maintenance workshop at lunchtime. Cork Community Artlink have kindly donated some fantastic props for the spaces. If you happen to be in the Douglas area, An Taisce Green-Schools with the kind support of the Pavilon Garden Centre are transforming two spaces side-by-side into an interactive play space for children to learn about the benefits of walking, cycling and electric vehicles through demos and activities. Also the Art Department of Cork County Council have created an interactive art space for all to enjoy. PARK(ing) DAY is being organised by the Cork Transport and Mobility Forum which consists of representatives from various Cork-based transport stakeholders including local authorities, public transport agencies, NGO’s and other stakeholders. One of the roles of the forum is to promote and support more sustainable forms of travel such as walking, cycling, public transport, park and ride/stride and carpooling. The PARK(ing) DAY event is being organised as part of European Mobility Week (16th-22nd Sept), and fits well with the Week’s this year’s motto: “Our Street – Our Choice”. Activities in cities all over Europe will raise awareness for more liveable street spaces for people and improvement of the public realm. Hence another Cork event in the Week will be the annual Rebel Pedal family bicycle parade on Sunday, 21st Sept, starting at 12noon from Grand Parade (registration from 11am), organised by Cork Environmental Forum. An Taisce Green-Schools Travel Officer Sandy McGroarty on 086 1067588 / smcgroarty@eeu.antaisce.org with any questions. PARK(ing) Day is an annual worldwide event where artists, designers, community groups and citizens transform metered parking spots into temporary public parks. For the first time Cork will take part in PARK(ing) Day on Friday 19th September 2014. Car parking spaces take up lots of room in the city’s street scape, in both city centre and suburban streets. Often this goes along with the absence of urban “green”, vegetation of any kind (trees, shrubs, flower pots etc. ), making streets appear to consist mostly of tarmac, concrete and brick, designed primarily for serving flowing motor traffic or parked cars. Local businesses would benefit from more footfall (on two feet or two wheels) on city streets, also outside the immediate City Centre. The appearance of streets as places to walk, stroll or just ‘hang out’ can be improved by alternative uses of the areas that now serve as car parking spaces. The street can become a “place” when there is a tree, a bit of green, like shrubs, flowers, a bench etc. Walking could be facilitated through a more inviting “look” for pedestrians; cyclists might avail of some extra bike stands in these places. Public life of all sorts would be encouraged if the street would be a more inviting place for people to be in, other than being a transient person behind the windscreen of a car, or just rushing through as quickly as possible on foot. The competition entails the design of a temporary installation to showcase options of improving the public realm, with the long term goal of eventually converting a number of car spaces and other identified unused street space in selected locations on a permanent basis. We welcome individuals and group collaborations. Please refer to the guidlelines and licence. The essential idea of parking day is to use the space in an alternative way in which it is normally used i.e. excludes cars. Advertising in a limited way is allowed naming the group/company is acceptable e.g. space organised by community xyz, supported by Bord Gais Energy. References to any specific products, offers, discounts are not allowed. Proposals will be evaluated by the T&MF on innovation, creative use of space, green aspect etc. The winning group/individual, as decided by the TMF committee, will be awarded the opportunity to turn their design into a reality.The winners will receive media promotion and a parking space for the day to transform. A public vote will decide on the winning design which will go forward to create a permanent park space should funding become available. Winners will be notified by the end of the 1st week of September 2014. 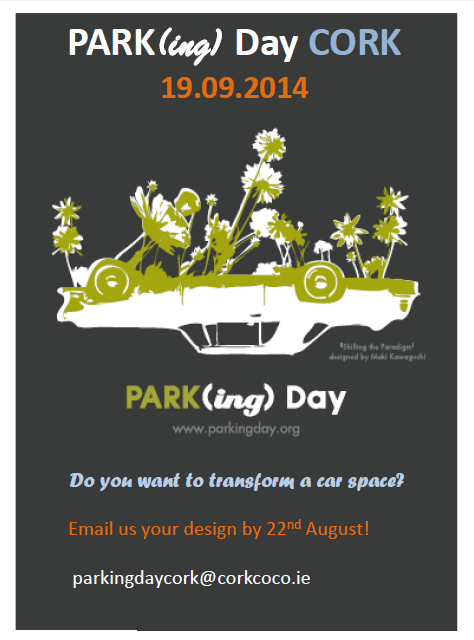 Please submit a one A4 page outline which should include a sketch/drawing of your design to parkingdaycork@corkcoco.ie by Friday 29th August 2014. Please include your contact details. Wonderful video which shows the flavour of all the events during Mix Your Mode Week, supported by SWRA and the BATTERIE Project. Special thanks to our media partner, RED FM; photographer, Darragh Kane; and Sonic Surgery’s Gordon and Seamus. And finally, let’s not forget all the volunteers who helped out with the information stand and events throughout the week. 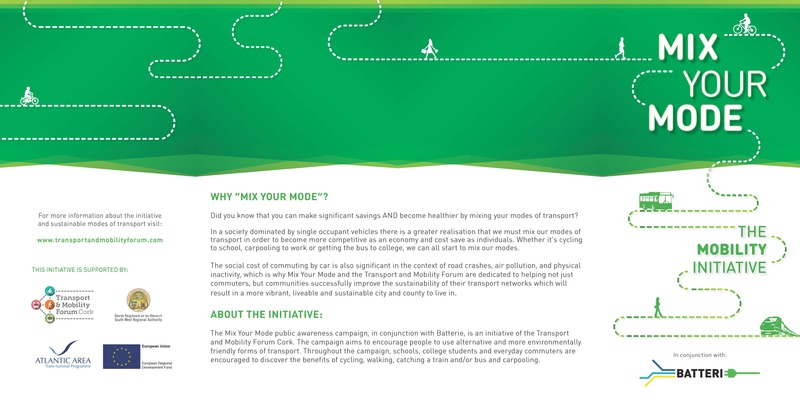 Mix Your Mode is a public awareness campaign encouraging the use of alternative and sustainable modes of transport. The campaign being run in conjunction with the South West Regional Authority’s EU Atlantic Area funded BATTERIE project, is an initiative of the Transport and Mobility Forum that will take place across Cork City and county from March 24th to 30th. Art Exhibition in Kent Station, Cork – 7 schools from Cobh exhibit art work exploring different sustainable modes of transport. An Taisce’s Green-Schools initiative will visit Green-Schools in Bishopstown as they carry out WOW days (walk on weekdays) where students, parents and teachers are encouraged to not only walk to school but also, cycle, Park ‘n’ Stride, use public transport or carpool instead of using the private car on the school run. Bishopstown Schools – Scoil an Spoiraid Naomh, St Catherine’s, Mount Mercy will have a Walk on Weekday (WOW). Students from Bishopstown schools will travel on the Red FM bus into town to highlight their local bus route and learn about the benefits of using public transport. Mix Your Mode in UCC (Honan Square) with information stands, presentations, display of electric bikes from City View Wheels and a visit from the Bike Doctor. At 1pm, a lunchtime cycle will take cyclists from UCC via Lee Fields and Curraheen River Greenway to CUH, and back to UCC. Cobh Mix Your Mode – All island Cobh WOW (Walk on Wednesday) with all pupils and even some principals and teachers from all 7 schools in Cobh planning to walk and cycle to school. All schools tally their numbers of children travelling to school for each mode to decide which school wins the prize for highest percentage of children travelling to school in a sustainable way. At 12pm, a prize will be awarded to the school with the highest number of participants who travel to school in a sustainable mode. 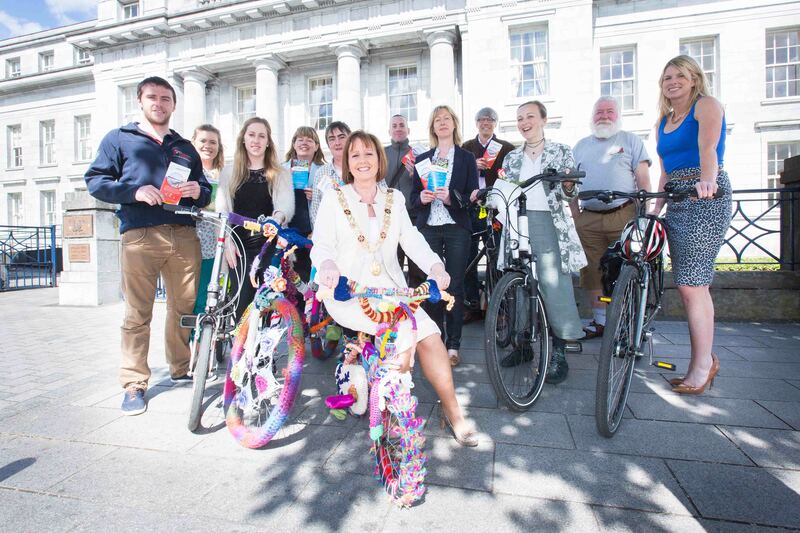 Cork City to Cobh Challenge – 2 Challengers to take different modes to Cobh travelling by bus/train and bike/ferry. The Square, Cobh – Information Stand and finish point for ‘Mix Your Mode’ challenge. Mix Your Mode at Mahon Point Shopping Centre with fun and informative events including health screening height, weight, BMI to encourage workers (and shoppers) to consider alternative and sustainable modes of transport. Fashion parade outside Brown Thomas to promote ‘chic travel’ featuring featuring bikes, scooters, ecar etc.